√ If by hard water scale on stainless steel tableware available vinegar cleaned. √ First with soap stains on stainless steel cutlery wiped, and then with a dry cloth to rub. √ mixed into a paste with chalk powder and water to wipe the smudges on the stainless steel tableware, and then washed with hot, soapy water, and then cleaning dry. √ cook the rest of the radish head repeatedly wipe stains traces Department be able to remove. Stains track produced long-time, then dip some scouring powder radish head, with good results. √ stainless steel surface dust, as well as easy to get rid of dirt was available soap, weak detergent or warm water wash.
√ stainless steel surface of grease, oil, lubricating oil contamination, wipe with a soft cloth, and later with a neutral detergent or ammonia solution or cleaned with a special detergent. √ stainless steel surface attached bleach and a variety of acid, immediately wash with water, then dip the ammonia solution or neutral carbonated soda solution, with a neutral detergent or warm water wash.
√ rainbow pattern in the surface of stainless steel, excessive use of detergent or oil caused by washing with warm water and a neutral detergent washes away. × cutlery on the salt, soy sauce, vinegar, spices, because these spices contain many electrolytes on one for a long time, the stainless steel will also like other metals, with these electrolyte from the electrochemical reaction, so Toxic metal elements are dissolved out itself will be corroded. × Do not use strong alkaline or strong oxidizing chemicals, such as baking soda, bleach, sodium hypochlorite washing. Because these substances are strong electrolytes, same with the stainless steel from the electrochemical reaction. 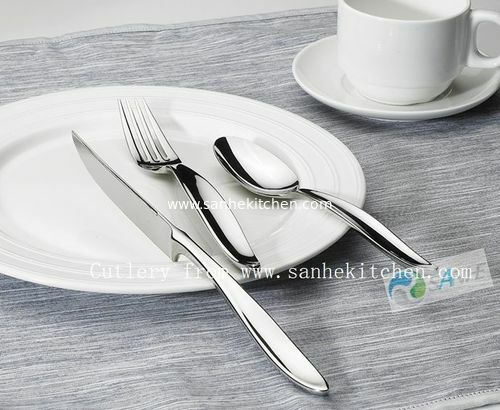 × Keep the utensils clean after use should be promptly cleaned of high grade stainless steel cutlery, in order to maintain its glossy appearance, cleaning to avoid collision, but do not use metal brushes wipe, then water stains wipe clean with a soft cloth kept separate so that the surface is scratched, tableware to keep falling as new. × Not occur the phenomenon of surface scratches, avoid the use of the bleach component, and the abrasive cleaning liquid, steel balls, grinding tools, etc., to get rid of the washing liquid, and then washed end clean water rinse the surface. × No matter how you cleaned the knife and fork timely wipe clean after cleaning to avoid rusting.